Now that I’ve accepted a new job starting next summer, it’s my stated goal to minimize the amount of time I spend in Oklahoma. Sorry, Oklahoma. To that end, though, I spent most of the winter break in Other States. First up: I’m not sure which state I should list as first. I got in my Jeep in Oklahoma at 6:00 in the morning on 12/23. It was unusually rainy. 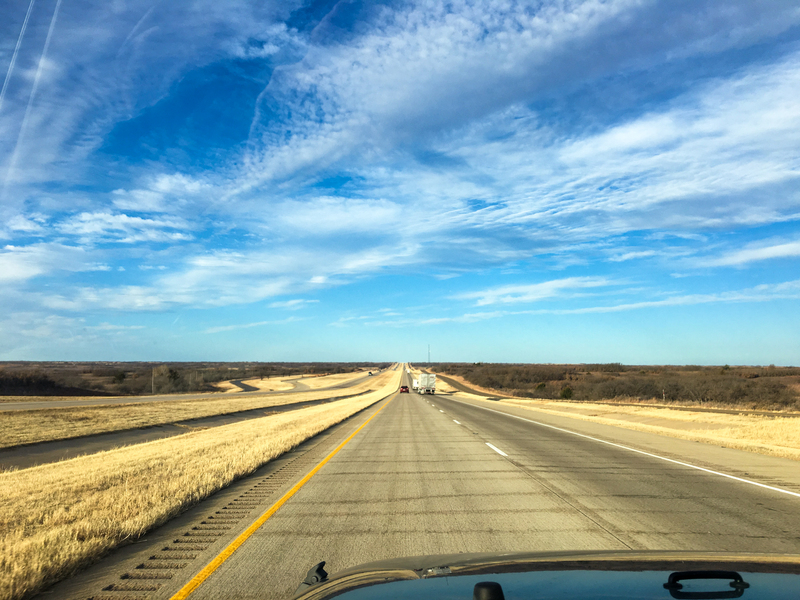 It turns out that there are no lane markings on I-40 heading west out of OKC because, I dunno, Oklahoma gonna Oklahoma. Seemed dangerous. And then the first non-Oklahoma state I hit was Texas. It’s not a bad photo for northern Texas. Good sky. The rain had stopped. The wind was blowing about 30 mph in my face, of course, and the Jeep was eager to plumb the depths of low gas mileage on most of the trip. Spent the night in Holbrook, Ariz., because I stayed the night in Gallup, N.M. last time I was through the area. All the hotel and restaurant employees in Holbrook were bizarrely good. I dunno. The diner where I had dinner was selling Navajo blankets for what seemed like a really good deal. Holbrook. 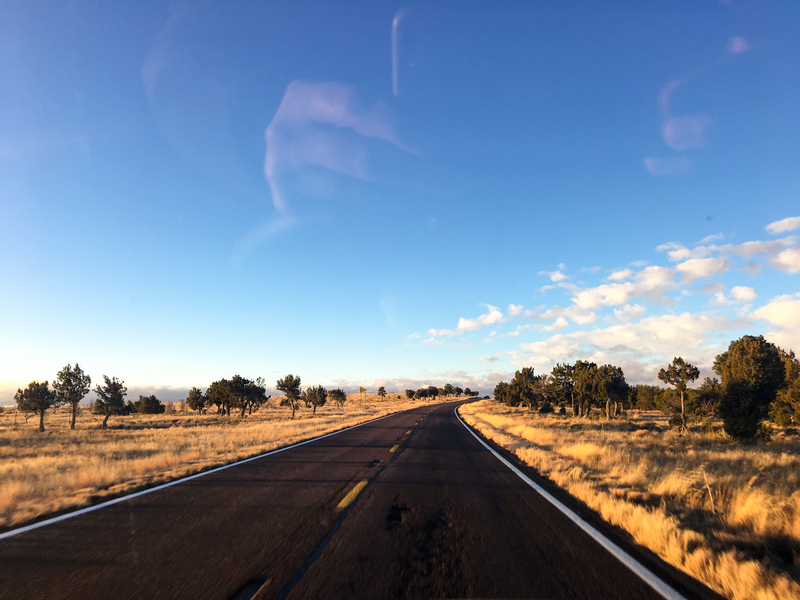 Also, Northern Arizona has some really pretty roads. The stretch from Holbrook most of the way down to Phoenix is pretty good. 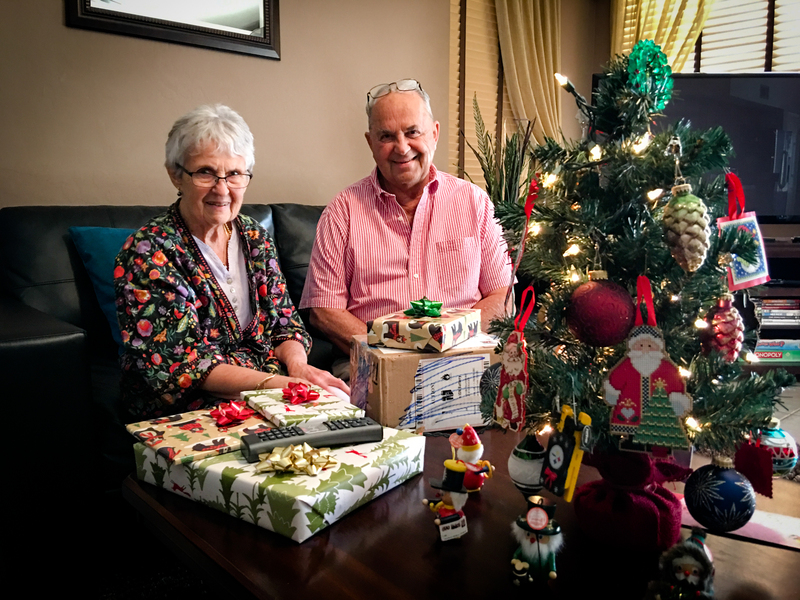 My parents flew down to Phoenix Christmas Eve and we holed up in my brother’s place in Ahwatukee for the week. This isn’t particularly interesting. You can skip ahead if you want. My mom has stylish bathrobes. 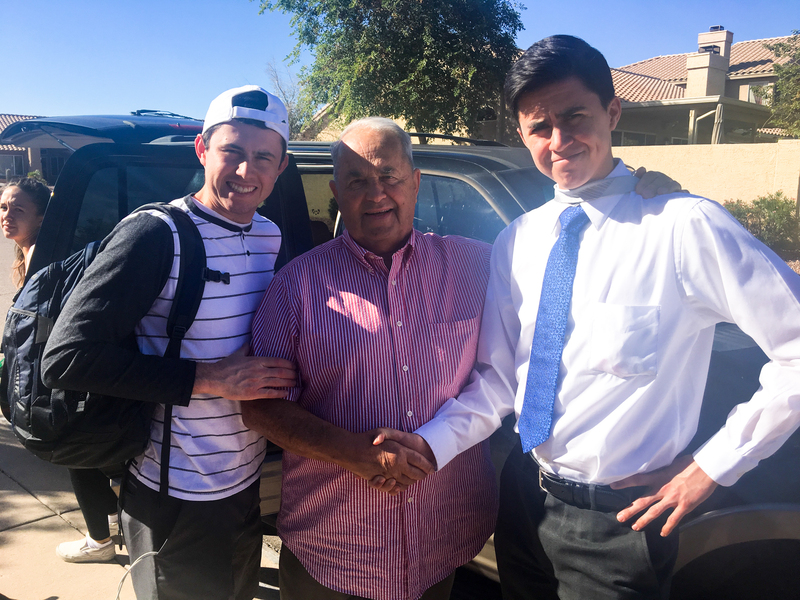 Day after Christmas (I think), my brother Rick brought his family through town on the way to Utah to disgorge my nephew at the MTC as he makes his way to yet another central American jungle (it’s *his* first, just not humanity’s). I probably have a representative picture of that somewhere. You understand this is mostly just a journal intended for my own future consumption, right? So there’s my dad with Ammon and Jacob and mad props out to Noelle on the photo bomb. We shake hands an inordinate amount in my family. I’m jealous of Jacob’s tie. 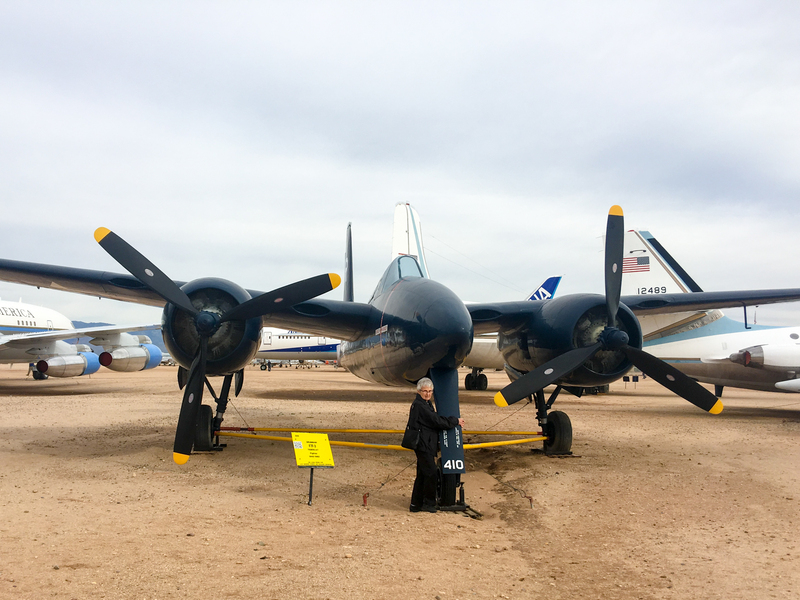 All right, then there’s a really good airplane museum down in Tucson that I wanted my parents to come to, and they kindly acquiesced to this keen desire. 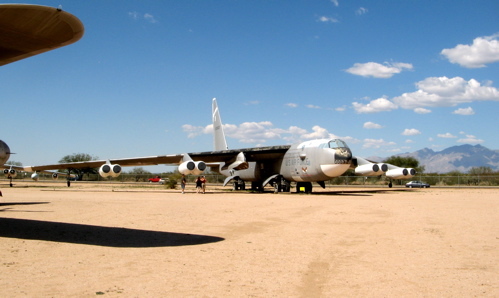 It’s the Pima Air and Space Museum; most of the airplanes are outdoors where you can climb under and around them. It’s nice to go to an outdoor museum for once. The extra fuel tanks really stand out on that one. And then my mom showed an unexpected fondness for the F7F Tigercat. Big Grumman fan. 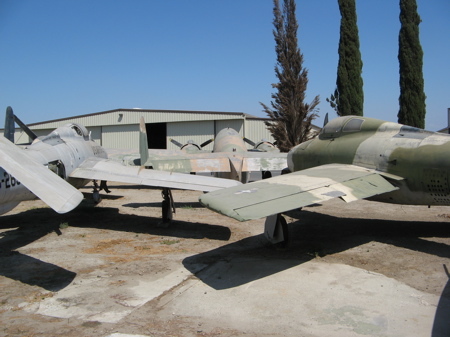 The museum is also the jumping-off point for the AMARG, the military aircraft boneyard out there. We went, but the old guy at the bus depot told us the wrong side of the bus to sit on. You know how bus depot old guys are. Anyway, it was cool enough, but the museum actually seemed more interesting. 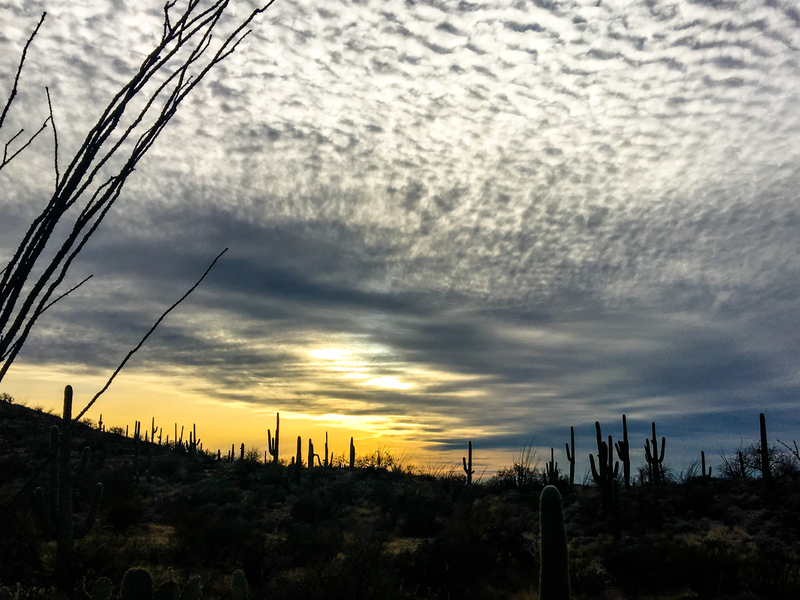 And then on the way back from Tucson, we took a quick loop through the Saguaro National Park (eastern part), making it officially my 39th national park visited. And when I say national park, I mean National Park, which is different from National Recreation Area, National Wildlife Refuge, National Forest, and National Battlefield. For one thing, it’s a park. Anyway: they had a lot of Saguaros. Also a pretty good selection of ocotillos and prickly pear. 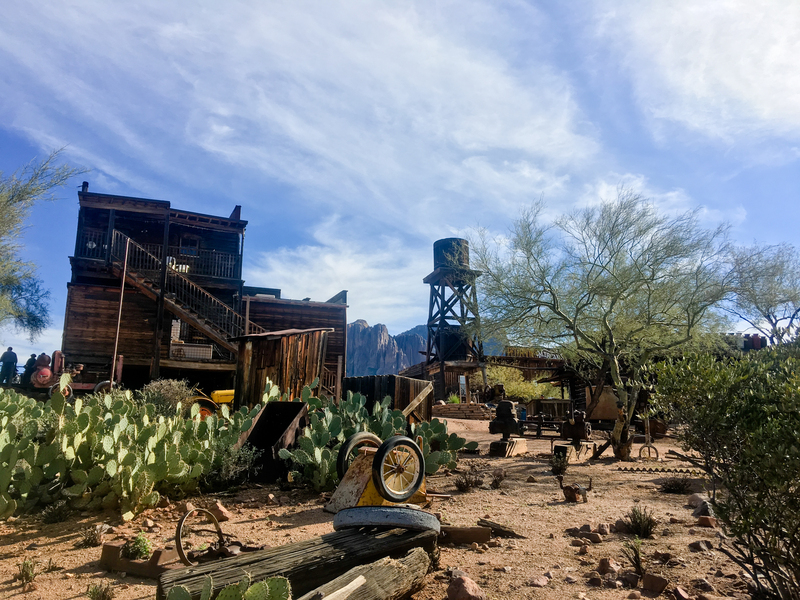 And also a real ghost town whose name I don’t remember, but where new buildings were being erected, making me wonder how “ghost town” was being defined. And then on New Year’s Eve I took off for Taos, because that’s just what I do. 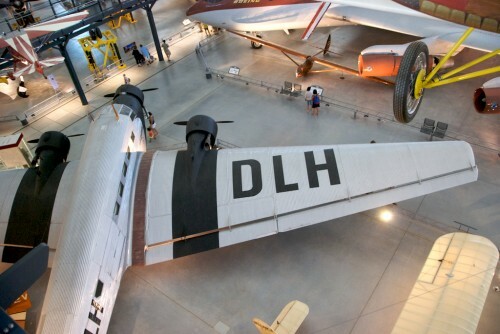 The best thing about the Udvar-Hazy Center and the one thing that they do that no other flight museum has yet accomplished is that they give the airplanes enough room and enough light and provide visitors multiple viewing angles. There, I said it. I can’t go to an aerospace museum without trying to rank it within the pantheon of aerospace museums and there were some times walking through Udvar-Hazy that I was thinking yeah, this is the best flight museum there is and that was based in large part on how easy they make it to see and photograph the planes. The USAF Museum in Dayton, for instance, is really dark so in order to take photos without a tripod, you have to do flash-fill and be happy with taking a photo of one small part of the plane. And in most flight museums, including Dayton, it seems like they looked at the arrangement of displays as a Tetris variant. 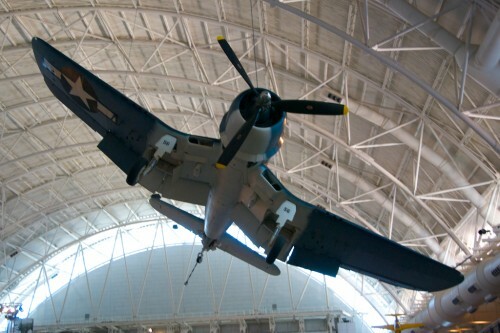 Udvar-Hazy gives the planes their due space. Well, except for in the commercial airplanes area, but those planes are kind of big, so I suppose it makes sense. 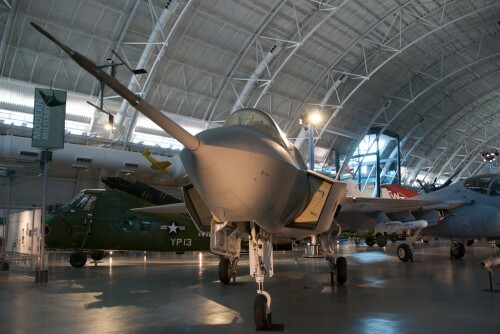 And if you could combine the National Air and Space Museum component on the mall in DC with the Udvar-Hazy Center, you definitely would have the greatest flight museum in the world. But they’re too far away, so you can’t. It’s like saying if you combined Seattle and Portland, you’d have the second largest city on the west coast. True but moot. Like most of life. Enterprise, the real fake space shuttle. 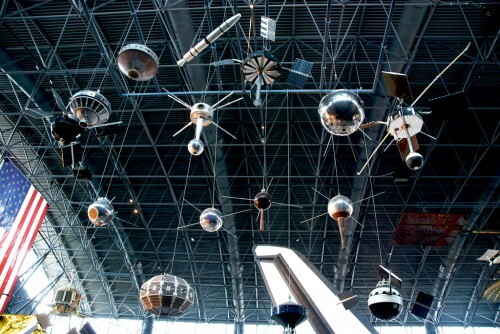 A galaxy of satellites. Maybe just a cluster. It couldn’t fly very fast because the propeller was so small. 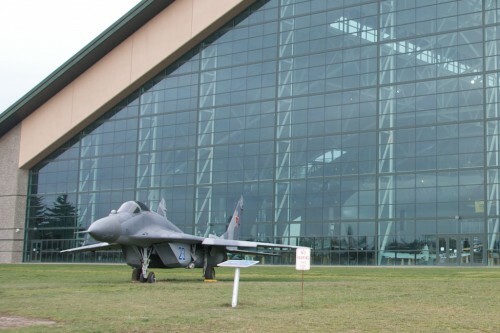 I think the Top Tier of aerospace museums is this one, the one on the mall, the USAF, and probably Pima/AMARG. It’s interesting how they don’t tell many stories in this museum — they mostly let the plane speak for itself. There are no big panels explaining the Wright Bros. or anything like that — I think most of that is on the mall. Without a doubt the least impressive gift shop of any top-flite aerospace museum. Walking through the museum, you start feeling like there are planes that should be there but aren’t, and then you remember that the other half of the collection is an hour away, which is sort of comforting in that you know that they know that this isn’t a complete something. They have a bunch of “last one like this that still exists” planes there, including some bizarre-awesome German WWII examples, like the late-war gigantic fighter plane with fore and aft props. Too bad those airplanes are evil. 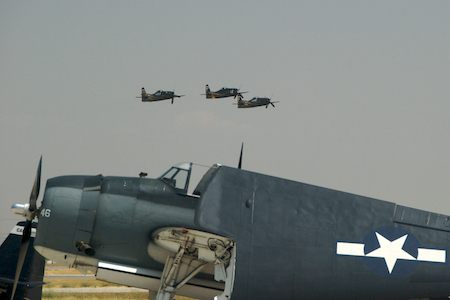 For some reason the only planes missing their wings were German WWII planes. There was no explanation. 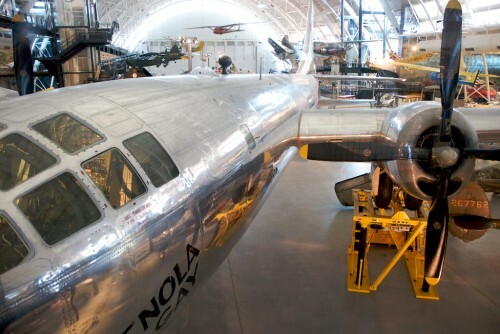 They put plexi-glass up around the Enola Gay so no one could throw stuff at it. Apparently that’s happened before. So yeah. 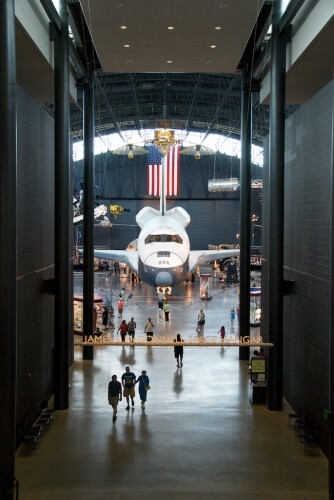 ICYDK, the Udvar-Hazy Center is located right by Dulles Airport in Virginia. The Smithsonian (or whoever) built it in order to house planes that wouldn’t fit in the regular museum on the mall. They have elevated walkways along parts of the perimeter that afford the top-down views. The museum is free, but parking is $15. The only food inside is McDonalds. There’s very little to buy in the gift shop. PS, If you combined Seattle and Portland, it would still only be the third largest city on the west coast. Which begs a discussion on the meaning of the word “launch”. Meh: life is imperfect. BTW, the important (or merely famous?) part of that photo is the big ol’ plane, not the two engines in front of it. And I’m sure the two guys in the picture are very important to their respective mothers. I tried to take a bunch of artistic shots of the plane, but they all basically look like a gigantic airplane with a bunch of other little planes around it. See above. I dunno, I suppose the ominousness of the MiG 29 is probably lost on the current generation that didn’t grow up back before the West realized that the Soviets weren’t actually competent at stuff. But still, in its heyday, this airframe was the symbol of black-hat aeronautical engineering. 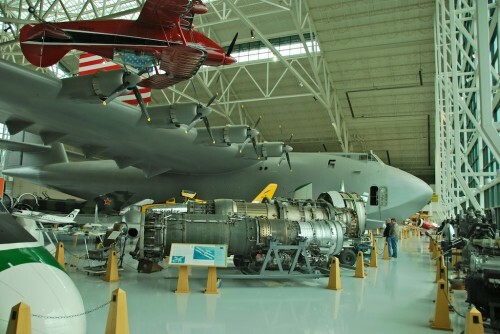 The museum is in McMinnville, Ore. and was sort of founded and is/was bankrolled by Evergreen International Aviation, which I think might do some cargo operations as well as, like, water-bombing stuff for (against) forest fires maybe. And maybe some contracting with internationally recognized clandestine service organizations — who’s to say? Wikipedia is vague in these matters. I skipped the IMAX theater. I should probably go to one again some day, but I established a precedent of not going to them during the road trip and I’d like to maintain some part of that road trip magic for a while longer, thank you. 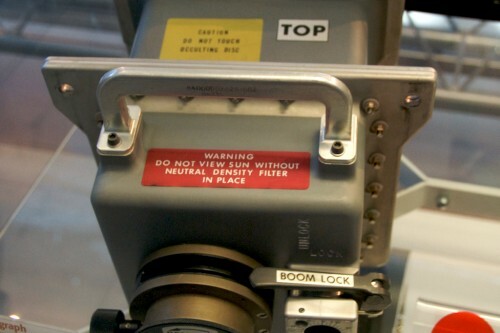 They have a missile launch simulator which takes five-plus minutes. 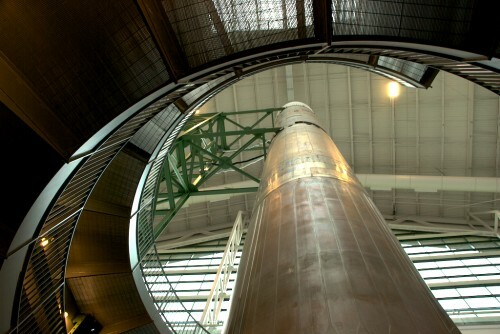 The Titan II missile behind you does not launch when the countdown gets to zero. McMinnville is not that easy to get to considering how reasonably close to Portland and Salem it is. Don’t remember much else. Been a couple weeks. 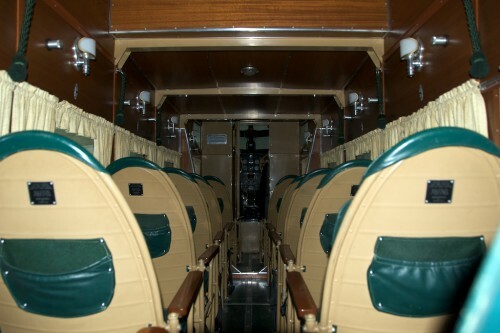 An interior shot of a Ford Tri-Motor. A P-40 Warhawk with Fighting Tigers livery and a handy drip-pan (which may have been made in China). 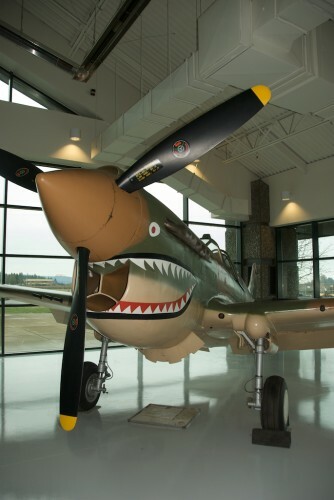 P-40s mostly flew for the British and Soviets. But the drip pan adds a lot to the composition. IMHO. A (strike)B-24 Liberator(/strike) B-25 Mitchell comes in for a low pass while some guys work on an F6F Hellcat that claims to have shot down 29 Japanese planes despite being part of something called the "Commemorative Air Force". Took 300 photos, most of which were awful. I blame the haze. And the number of people that were there. And my unwillingness to go stand in front of all the people for an unobstructed view. Plus, really, what kind of composition actually works for planes flying alone against a hazy-blue sky? Nosuch. 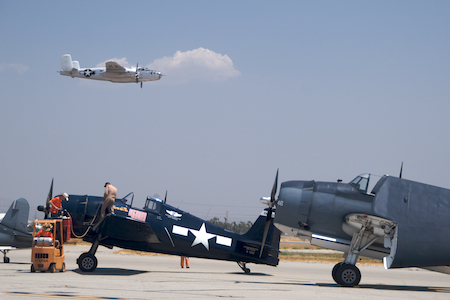 Air Show was at the Chino Airport, which is also the home to the “Planes of Fame Museum” I visited a while back. Was hot out there — 90 maybe. Got good and burned on my neck, most importantly. The show was mostly old planes, mostly from World War II, although there was a brief Korea showcase with an F-86 and a MiG 15 chasing each other around. Also had an A-10 Thunderbolt, which is usually pretty fun to watch (IMHO, slow flying trumps everything at an air show), and a C-17, which isn’t necessarily fun to watch. And the tri-tip barbecue sandwich was way better than I expected I’d find at an air show. Three aerobatic F8F Bearcats fly in formation, shaming one of their less well-heeled bretheren into folding up its wings. So I really didn’t rock it on the photography. Many life-lessons were learned, however. And the old planes looked and sounded cool. First off: best experience on the 91 ever. Ever. It was like the 909 had decided to give up driving completely on Sunday, much to the delight of the 949ers venturing inland. If the 91 were like that all the time, I’d start flying out of Ontario. Honest: *Ontario*. 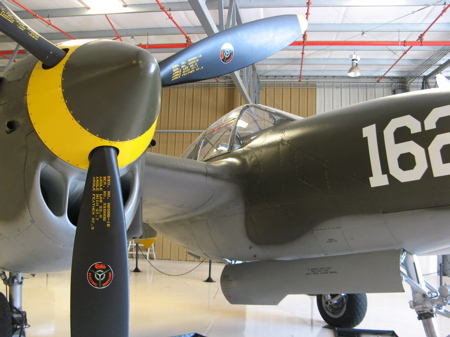 As it turns out, P-38s are about as weird-looking in real life as they are in not-real life. Me? I’m as weird-looking in real life as otherwise as well, thank you. 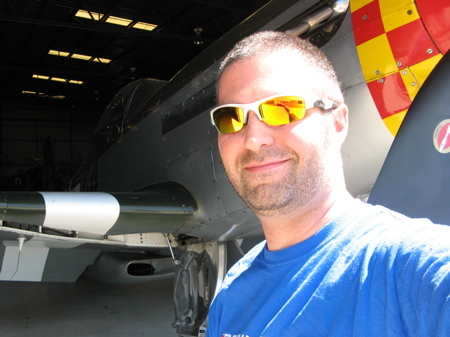 And I’m totally blocking your view of one of the three restored P-51s they had there. An SBD Dauntless torpedo plane — the most successful torpedo plane in WWII. Seems like every air museum has its derelict plane section. I like this shot from the standpoint that it makes me feel like these poor old planes just want to out and fly again. And, yes, this is coming from the guy who thinks the movie Cars was kind of dumb because, well, why are they cars?! 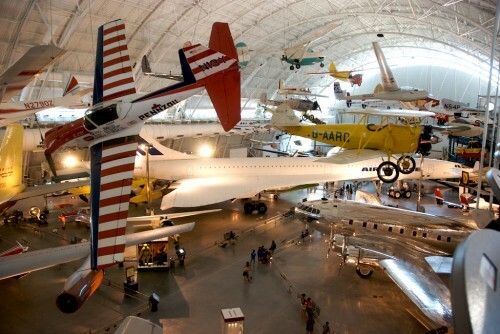 It was a pretty cool museum for its several World War II-vintage airplanes. Esepcially cool for me as a self-styled connoisseur of WW2 (sort of). 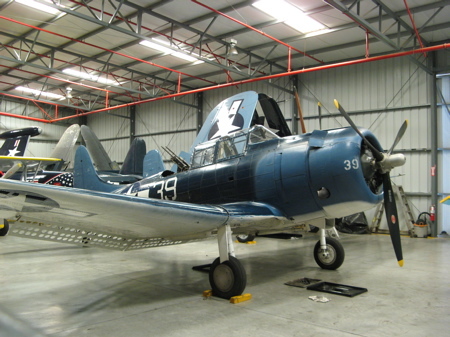 I think this was the first SBD Dauntless I’ve seen in the — well, not the wild. I guess this is pretty much just a zoo. But the cool thing about this museum is that it’s actually more of a restoration shop, meaning that they restore the planes back to flyability. Meaning that the P-51s, on given weekends, taxi out to the runway at Chino Airport (to which the museum is attached) and, like, fly. As do a number of these other airplanes. Of course the docents are imperfect. I asked one if they had an F4F in their collection. I: “that’s too bad, I thought you guys had one — doesn’t seem like there are many of those around”. At which point I’m wondering where he’s finding all these F4Fs that seem to be invisible to one such as myself. For you see, an F4F *is* a Wildcat. And it was put away in some post-flight hangar somewhere, so I didn’t get to see it. Plus I’m guessing it’s an FM-2 more than an F4F, meaning that, I guess, he was technically correct in the first place. 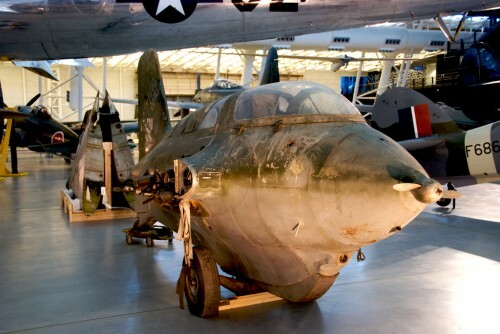 Except that no one would (intentionally) say that his museum doesn’t have an F4F when it, in fact, has an FM-2. Can’t imagine there are more than five or six flyable Wildcats left in the world. 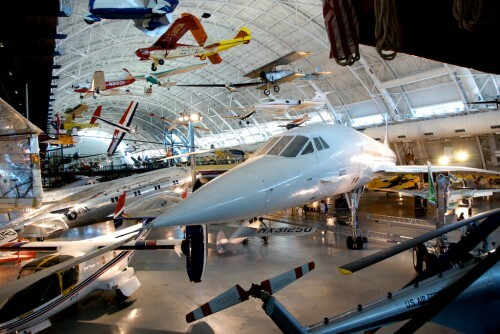 It’s a good 2-hour flight museum. $11 for adults, $4 kids. And apparently they randomly send one or two planes up every weekend, except for certain weekends when it’s pre-meditated. And because, let’s face it, I’m never actually going to get around to putting anything on Flickr. 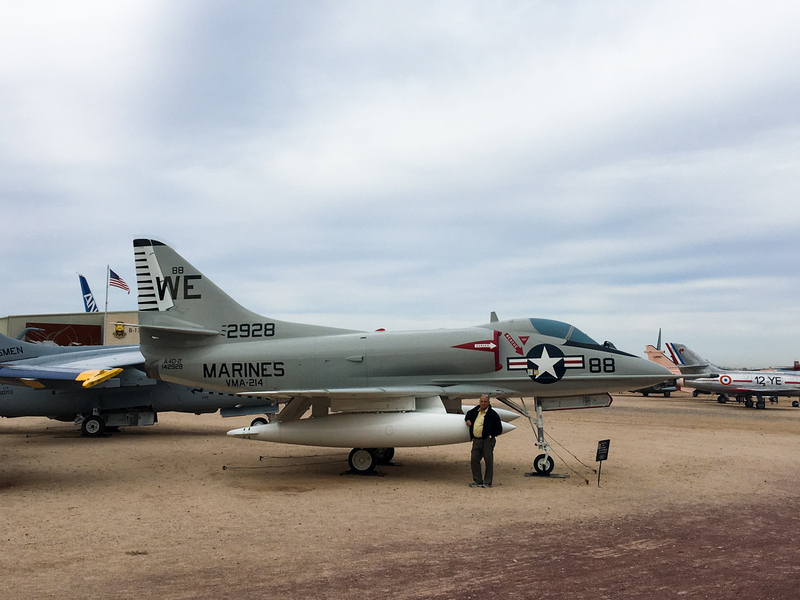 And because the last set didn’t include any actual photos taken from the boneyard at Davis-Monthan (AMARG — Aerospace Maintenance and Regeneration Group), here are a few. The bus, as mentioned last post, made it tough to get good photos. For me. Maybe DLF got something better. 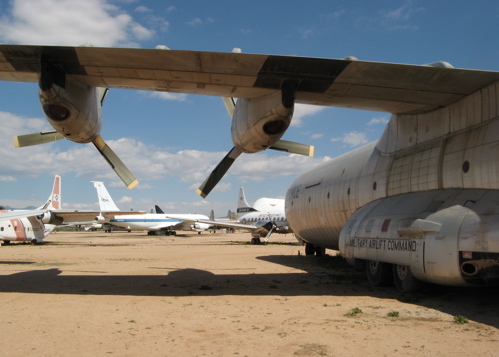 The above C-130s are in the “could be re-used” wing of the boneyard. And then these poor guys are on the cannibalization side of the street. But the view from Google’s satellite maps are, IMHO, the most interesting (zoom in and scroll around for best effect). Enjoy. Or, “have enjoyed”, I guess. 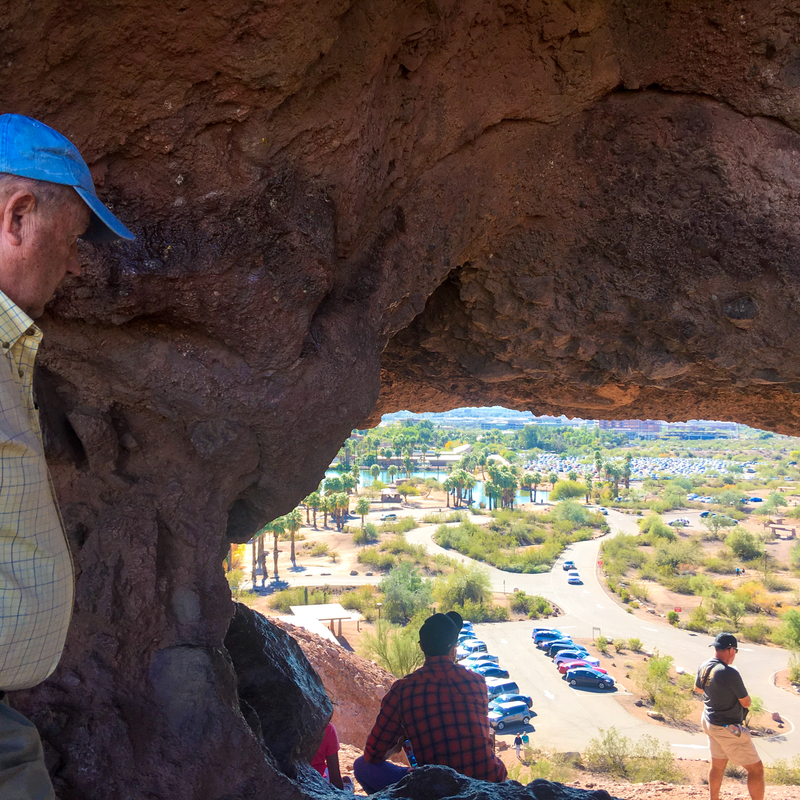 Went out to Tucson last weekend ahead of some business meetings I had in Tempe on Tuesday. 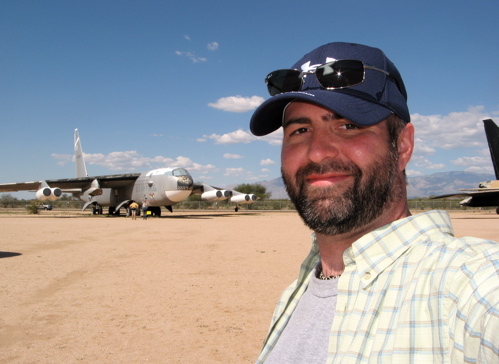 Primary purpose: visit the AMARG and the Davis-Monthan Air Force Base airplane boneyard (I think “boneyard” sounds less ominous than “graveyard”, although I suppose maybe it shouldn’t). 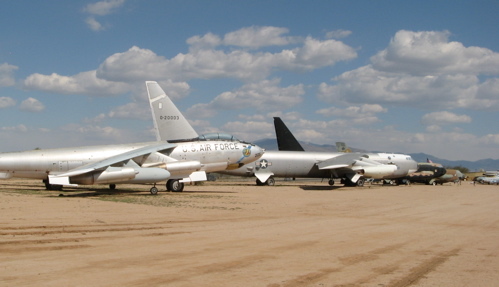 Tours of the boneyard are facilitated by the Pima Air and Space Museum, located around the corner from the base. The museum and the boneyard were both cool. 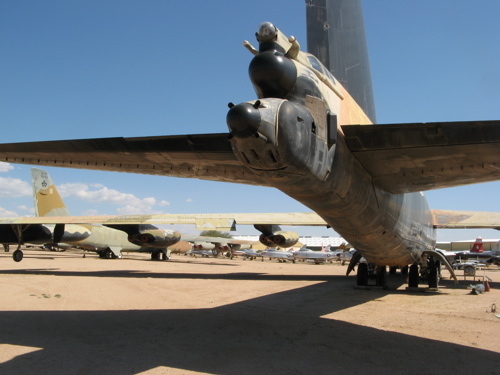 The B-52 above was one that dropped several of the x-planes — you can see the spar on the right wing where the planes were carried pre-drop. 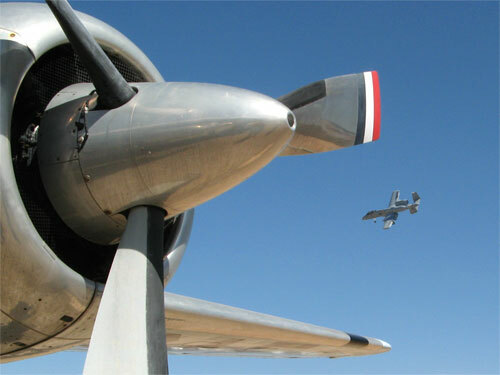 Above is an A-10 Warthog banking hard over the top of Davis-Monthan AFB as seen between the prop blades of the DC-6 that used to be John F. Kennedy’s Air Force One. 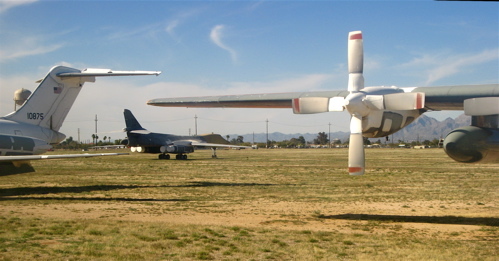 Above is a Douglas C-133B and the view from the far end of the museum’s 75 acres of airplanes. 75 acres of airplanes is a lot of airplanes. There aren’t many ropes keeping you away from the aircraft. If you want to get down on your belly and see what the underside of a B-52 looks like, you’re welcome to do so. Oh — right, so on the Sunday we were there, the air force base was doing practices for the spring and summer air show season, including having civil pilots get qualified to join air force pilots for “heritage flights” (in which a couple of old planes, piloted by civilians, fly in formation with a couple of current air force planes). This meant we got treated to an air show with aerobatic maneuvers from an F-22, F-15, A-10 (I’m an A-10 fan), F-4 Phantom, P-51, and P-40. Actually those last three didn’t do anything aerobatic, but the first three did a lot to make up for it. Like, for instance, the F-22 stopping and hovering mid-air. Pretty trippy. 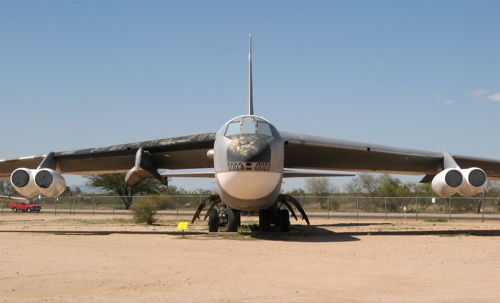 They actually have three B-52s there — that’s an imposing-looking, ominous airframe. IMHO. They also had a nice collection of WWII bombers — a B17, a B24, and a B29. Again, with full belly-based viewing privileges. The docents were all pretty old and friendly. They had a couple of Lockheed Constellations and a Sud Aviation Caravelle — I’d never seen either of those up close before. Included pretty much every American jet fighter up through the F-15. Also included a bunch of huge ol’ cargo planes. It’s just a lot of airplanes and a lot of access to those planes. It’s at least a one-full-day museum. If you go see the boneyard, which we did, it’s at least a day and a half. It was pretty cool seeing how different the aircraft designs have been throughout the Air Force’s history. In a world where every commercial aircraft built in the last 50 years still looks like a 707, it’s nice that *someone’s* trying. You have to make reservations to take the tour of the boneyard itself. Those tours only run on weekdays. You’re only allowed to see the boneyard from the tour bus. It’s kind of hard to get good pictures through the windows of the bus — all the photos above were taken at the museum. 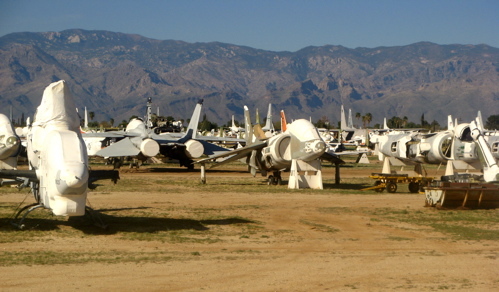 It was weird to see so many recent airframes among the retirees at the boneyard (including B-1 bombers). Also strange that we’re still building new C-130s when there are apparently hundreds that have already been retired. I can only hope that someone’s done a cost-benefit analysis on some of this stuff. Anyway: cool trip. Many planes. Nice weather. Recommended.